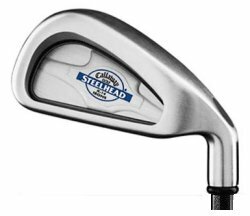 Callaway's 2007 Steelhead X-14 line offers the best in club technology. Unique to these clubs is the variable face thickness, a manufacturing process that effectively distributes weight around the head to optimize the performance characteristics. The long irons have a lower center of gravity for maximum forgiveness, crucial for those who need a 2-iron performance from fairway or tee. The ball will come off with a flat trajectory and will offer more roll. The sleek finish belies the maximum perimeter weighting. These are clubs that make golfers more confident. From Mary of Oceanside, California on 3/26/2008 . I was out playing golf on the weekend and brought out my new Callaway Steelhead X-14 2 Iron. Beautiful, smooth and lightweight. A good buy! 5/28/2003 – If I buy the iron with the cover and decide I don't want the cover anymore, can I return it and get a refund for the $5.00? . . . Response From FirstFairway: If your cover is undamaged and unused, you may receive your full refund within 30 days of receipt of the product. Entire Steelhead Set (steel shaft only) on sale now!